Honey & Butter: Zucchini Chips - So Addicting! Recently I tried Terra Chips, and found that I loved the different flavors of the root vegetables combined with the salty crispy texture. 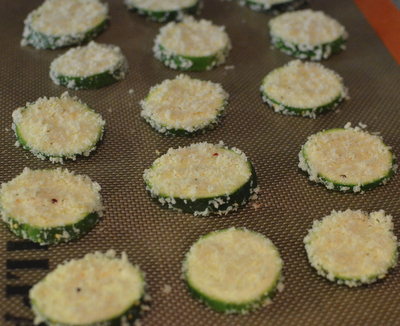 Then I decided to make these zucchini chips at home - and they are even better than potato chips! Wash the zucchini and then slice using the thinest setting of your mandolin. Lightly dust zuccihni with flour and Parmesan on each side. Browse for other healthy options by clicking here. These look delicious! I will definitely be making them soon!